Even with the advent of technology, the old business of letterpress printing remains to be a sought after craft for artisans who are in the pursuit of a beautiful work of art. With its timeless appeal and superb aura of quality, letterpress printing brings a sense of class to any printed material that offset printing, or any other form of printing method, could not achieve. Letterpress printing is a method of printmaking that involves locking movable type into the bed of a press, inking it, and pressing or rolling paper against it; hence, creating an impression on the paper. A letterpress is made up of various parts: a press bed, where the movable type is set up; a roller for inking; and a tympan or a stretched disc or drum, on which the paper is attached. Letterpress printing consists of various stages: composition or configuration, imposition and lock-up, and printing. 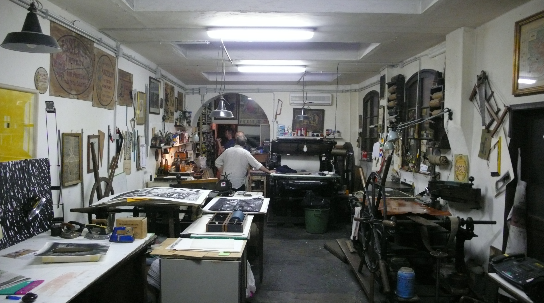 In a small printing press, all the processes may occur in a single room. However, in larger printing plants, where newspapers and magazines are created, each process may happen in a distinct department with its own floor or room. In the mid-fifteenth century, letterpress became the primary form of printing and communication. It was the only method of publishing booklets and pamphlets and other printed materials like public notices and broadsheets. Johannes Gutenberg was credited as the inventor of the moveable type of printing press. He also created his own version of wood block printing, which was based on the existing wine press. The Gutenburg’s hand press, or the screw press, which was used to print 180 copies of the Bible, was considered to be the first instance of mass communication. This monumental accomplishment was very instrumental in allowing the common people (or the public) access to the printed word; thus, encouraging the spread and sharing of ideas and information across the globe. From its invention during the mid-fifteenth century to the mid-nineteenth century, letterpress remained the main method of printing and distributing information—until the discovery of new printmaking methods like lithography printing and offset printing. The desire to produce printed materials—quickly and efficiently—gave way to the invention of the lithography printing. The rise of the lithography printing caused a decline in the use of the letterpress since the former could print large quantities of pages at a lower cost. For over a hundred years, lithography replaced the letterpress as the key method for printing magazines, newspapers and advertising posters. It only became obsolete with the introduction of a new printing technique known as offset printing, which was invented by Ira Washington Rubel, an American printer who owned a lithograph press. Today, offset printing is considered one of the most common method of creating printed materials. The emergence of photopolymer plates provided the perfect opportunity for the resurgence of the letterpress printing. This new technique helped reintroduce the letterpress printing in a brand new light, thereby encouraging a newfound admiration of the medium throughout the design community.